One thing about Trump that you have to admire, is how perfectly he reflects the republican way. That slick salesman, tap dancing across the store, will sell you the shirt off his child’s back, but when he goes home, he would never use those products that he sells. They have no choice. They must present a virtuous and church worshiping politician to get elected, but then their caught stumbling through the red light district. Perfect example is the national debt. Remember what sticklers they were about the national debt during Obama? I’m sure they conveniently forget their warnings about increases to our national debt was their sole battle cry against Obamacare. After all, their resistance to Obamacare was one of the biggest battles in republican history. Legislation to give millions in tax returns to their families passes in seconds, when it comes to treating your cancer stricken mother or ill child, they fight that tooth and nail! But now, under Trump, the federal deficit is up 17% to $779 billion for the fiscal year. Plus, we have nothing to show for it. At least, with Obamacare, our healthcare is taken care of. But, under Trump, this ballooning deficit just gives journalists like me some ammo to write about. Right there is the mother of hypocrisies. The only thing republicans care about is lowering taxes. Although lowering taxes does not make a great economy has been proven time and again, they keep insisting that it does. But how do you lower taxes and the deficit at the same time? This is tough to say, but in my opinion, one of Trump’s greatest points of hypocrisy, is his stance on illegals. Illegal immigration is why Trump is president. That was his biggest platform during the campaign. Trump used illegal immigration to gain the votes of the uneducated third of America. During the campaign, Trump assured his minions that he would boot illegal immigrants from the country. This was music to his supporter’s ears. This meant that job they used to have, which was taken away from them and given to the illegal, at a fraction of the salary, would be available again. After Trump was elected, I was astonished when he actually applied for more foreign visas to work at his resorts. You’d think, while he is president, he could hire Americans. Just for a few years, while your biggest platform is forcing American companies to hire Americans, you could try to do the same. It’ll cost more money, but you’d think you’d make that up ten fold in the advantages. Think of those beautiful photo-ops — Trump walking through his resorts and greeting the war vets and budding students that he hires. We don’t see any of that. Trump only hires foreigner workers at his resorts, PoliticalHaze. He also makes all of his suits and ties on cheap Chinese assembly lines, CNN. His daughter follows his example to a tee. Ivanka tries to make herself out to be this strong women liberator. Meanwhile, she pays her Chinese female employees a whopping one dollar an hour to make her clothes, Forward. 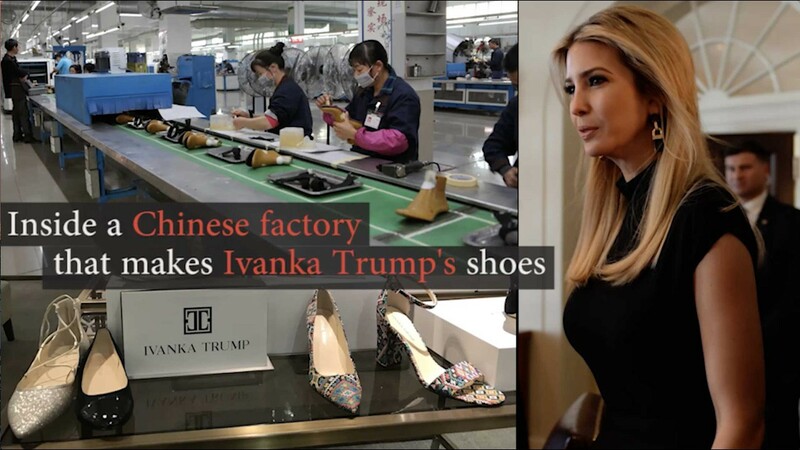 In fact, her Chinese shoe factory was one of the worst violators of labor laws in the area, USAToday. How do you support someone like this? 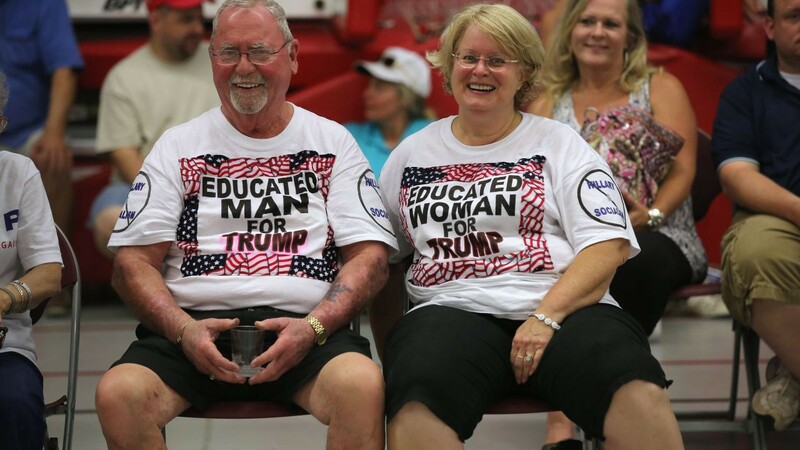 How can you, with a straight face, stand at a rally, waving signs bearing his name? How can you support a politician who doesn’t even practice the laws he administers? It might be hard to get Americans to work for the salary Trump pays illegals, but I’m sure he could find some hard working American to do any job at his resort for minimum wage. Under labor law, Trump has to prove that there are not enough Americans who are willing to do the job, in order to get his H-2B visas. In other words, Trump has to first offer his jobs to Americans, and then prove that no one wants his jobs. According to the Washington Post, Tricky Trump hurdles this impediment by placing just two tiny classified ads for waiters. The ad contains no phone number, no email, but a fax number! LOL! When no one applies to these jobs, Trump gets his visas and hires his foreign workers. That tweet summed up Trump’s campaign. There were even mentions of punishments being imposed on companies and people that hired illegals over Americans. Which was kind of strange to hear out of Trump’s face, because all he ever did was hire illegals. Literally, Trump is on stage telling his minions to do as he says not as he does. That’s the American capitalist mantra, right? There is nothing wrong with assuring your business the highest profits. Such is the will that made America the greatest country in the world. Good god! Imagine if Obama or Bill Clinton had some company, powered by illegal employees. I’m they sure would’ve been impeached for such travesties. And they should be. As he should be. If you support a politician that does not practice the laws they enforce, it says a lot more about you than it does the politician!